First worldwide aid of backfit to an existent railway bridge on the river Reno, applying the state – of – the – art technologies of suspension bridges. Executed on railway line Bologna – Padova, managed by R.F.I. S.p.A., near Poggio Renatico, on a bridge from 1860 and reconstructed after the bombing during the Second World War, in 1947. 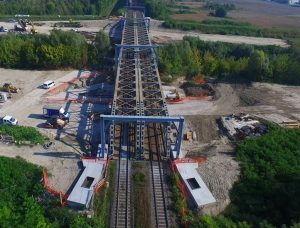 Ceprini Costruzioni S.r.l., a company from Orvieto, realized this high civil engineering works using cement and steel. 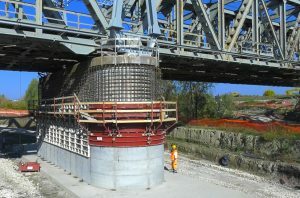 The consolidation project, developed by Rete Ferroviaria Italiana S.p.A., will improve the safety conditions – as said before, the one worldwide – it has concern, in the specific case, the substructure formed by foundations, from the piers and the abutements, the bridge superstructures, made up by independent composite trusses. A complex and precise series of construction phases realizing reinforced works, both substructures and superstructures. 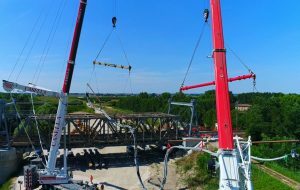 In particular, the new support system, stiffening and consolidation of the decks, provide the installation of steel portals, where strands support the existing bridge, through a similar system used for suspension bridges. On the 15thDecember, this kind of work has been matter of convention, in the Great hall’s Faculty of Engineering in Bologna. The morning’s study was organized by CIFI – College of Italian Railway Engineers, with different speeches of Order of Bologna’s Engineers, President Ing. Andrea Gnaudi, the Headmaster CIFI section of Bologna Ing. Massimo Del Prete, Ing. Luca Cavacchioli (Production Territorial Manager of R.F.I. Bologna), Ing. Vincenzo Cefaliello (Manager of Engineering and Technology of R.F.I. Bologna), Ing. Gloria Imbroglini (Site Manager), Ing. Gianluca Nestovito (Engineering Supervision of Works) and Ing. Vincenzo Spagnoli and Ing. Alessio Curti of Ceprini Costruzioni S.r.l. From the University of Perugia, Ing. Paolo Petrella and Prof. Marco Mezzi, have interceded talking about the backfit realization of the works. During the opening of a speech, the greetings of Ing. Alessandro Paglianti and Claudio Lantieri. To be present in the Great hall, Mr. Franco Ceprini, founder of the company. At the works’ presentation there were students from the Facutly of Engineers and self-employed.